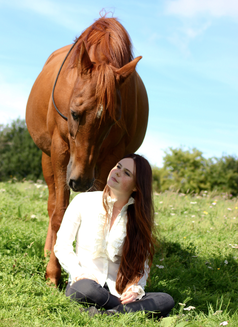 Fairhorsemanship (FH) is a humane, science-based horse training service created by horse trainer and qualified equine behaviourist Alizé Veillard-Muckensturm. 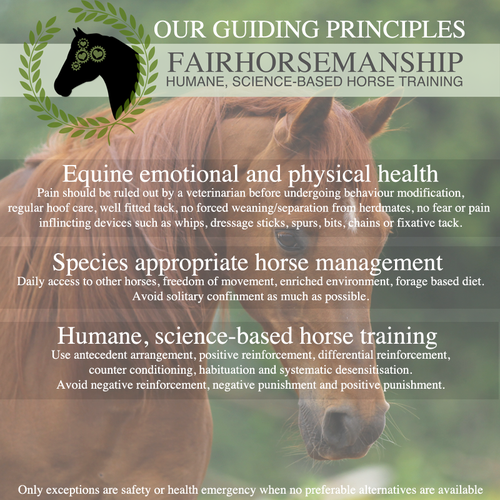 Fairhorsemanship is dedicated to promote non-coercive training methods, to reduce the use of aversive tools and methods in handling and training horses, and to promote appropriate horse management. Alizé's work is based on the sciences of psychology, ethology and ruled by ethics. She is also a member of the PPG the association for force-free pet professionals. Alizé provides private lessons and horse training session within South Wales (UK), international talks, training days and online coaching. Click here for more info. Fairhorsemanship accepts no liability for any damage to or injuries incurred by people, animals or inventory during any activities inspired by Fairhorsemanship content. Riding and handling horses are High Risk Activity and holds a potential danger, all horses may react unpredictably on occasions.